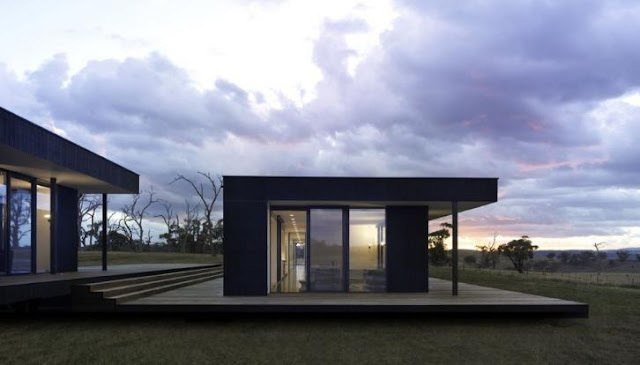 The modular house design is composed of two intersecting diagonal axes centered around social area - dining room as a meeting place. One axis incorporates the bedrooms, the other axis includes the living room and public entry hall. The design consists of two modules and uses new modular technology - Kullman Frame System (KFS), which allows build modular homes of prefabricated steel hollow tube frames. This prefabricated system has capacity to achieve 12 stories height and uses patented connection technology that speeds the overall construction process and minimizes field finishing. This prefabricated courtyard home supports an indoor/outdoor lifestyle that extends the utility of the house beyond its interior space. The home combines modern, clean design with Cradle-to-Cradle CM inspired materials and LEED® Platinum environmental program. There are three different versions of this model that range from 2 bedrooms and 1 bath at 950 square feet to 3 bedrooms and 2 baths at 1232 square feet. Wood ceiling, cork floors, optional wood siding and natural wood millwork make the prefabricated courtyard home comfy and warm. Clerestory windows, floor-to-ceiling glass, transom windows and solar tubes bring light into almost all parts of the house, including the closets. Appropriate shading, ceiling fans and super insulation reduce cooling/heating needs and smart AC/heating reduces power bills. The Nest Learning Thermostat selflearns how inhabitants live and keeps the home at the prefered temperature. The living, dining, and kitchen space are all connected, it makes easy for all in the family to do their own thing – or share. 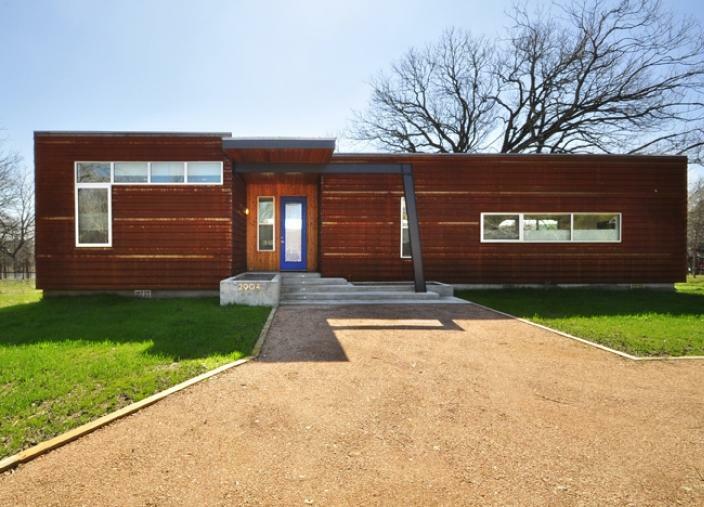 This custom prefab modular house (Austin, Texas) is green, efficient and modern, it consists of two modules, and it aims to offer an affordable package deal. With facade in a patinated metal, the custom prefab house has direct connections with the external space via glass sliding walls and a large covered deck with area up to 2,000 square feet. This house has 3 bedroom and 2 bath, the total area is 1,400 square feet. The home features an open floor plan dining/kitchen/living area in one module and private rooms in the other. 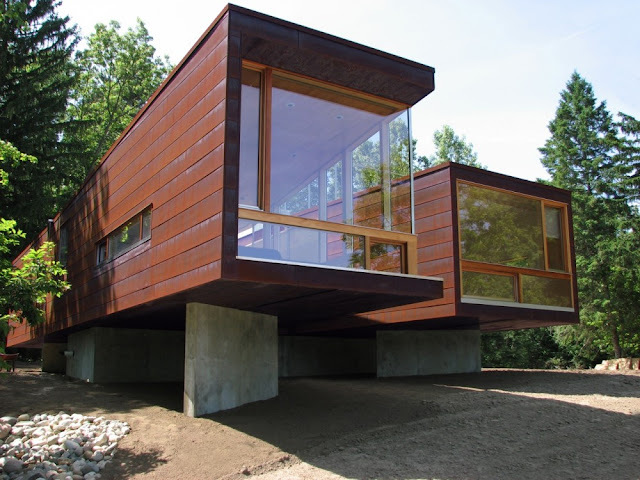 The combination of two modules form an L-shape structure, and the living spaces are contiguous with a covered backyard deck that expands the living area by 600 sf. The house features large sliders that bring daylight in, carefully placed windows, and ten-foot ceilings. Green features include Gerkin high-efficiency windows with thermally broken frames, 2x6 exterior walls, an Energy Star high-efficiency cooling/heating system and a Galvilum double-lock seam metal roof. 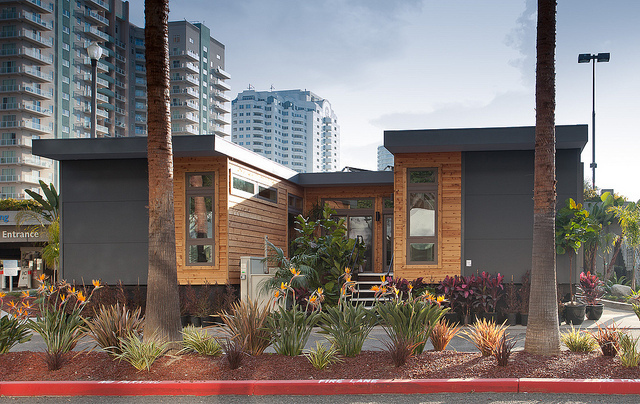 This house came in at $192 per sf.